It seems like every year, fans expect the Detroit Red Wings to slow down or the Chicago Blackhawks to finish the postseason without a long run. The thought has consumed fans throughout the NHL. Both teams bulked up before Monday’s trade deadline, making those thoughts seem irrelevant for yet another campaign. The Chicago Blackhawks added forwards Andrew Desjardins and Antoine Vermette, along with defenseman Kimmo Timonen, while the Red Wings added forward Erik Cole and defenseman Marek Zidlicky. Opposing teams will have a handful come playoff time. The Blackhawks have played in four of the past six Western Conference Finals, with two of those years resulting in Stanley Cup championships. The Red Wings have skated in each of the past 23 postseasons, which includes an impressive four League championships and six Stanley Cup Final appearances. The success speaks for itself, but the legacies could continue well into the future. Monday only proved that theory. When it was announced that the Blackhawks would be without Kane for an extended period of time, the hopes for a third championship in six postseasons seemed dim. General manager Stan Bowman had a different view, though. Within four calendar days, Bowman landed Vermette in a deal with the Arizona Coyotes in exchange for a 2015 first-round pick and prospect defenseman Klas Dahlbeck before acquiring Timonen in exchange for a 2015 second-round pick and a conditional 2016 fourth-round pick. 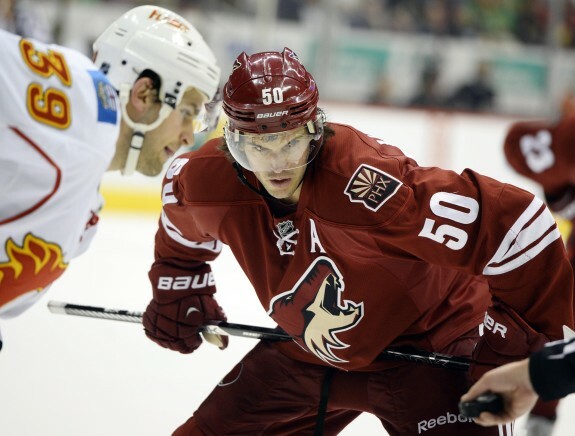 Vermette, 32, is set to become an unrestricted free agent (UFA) this summer. He contributed 13 goals and 35 points in 63 games for the Coyotes this season, but has reached 20 or more goals four times in his career (not to mention hitting 19 tallies twice). He’s not Patrick Kane, but he should provide plenty of scoring touch to a dynamic second line that has featured the likes of Brad Richards, Patrick Sharp and Brandon Saad in the past. The defense, which seemed to be a point of concern for Chicago, received a major upgrade with Timonen. The Finnish defender has not played this season due to a blood clot discovered over the summer; however, if he is healthy, he could send an impactful shockwave through the lineup. The four-time All-Star was a minute-eater in the past, although he will likely be delegated to third-pairing duties in Chicago. 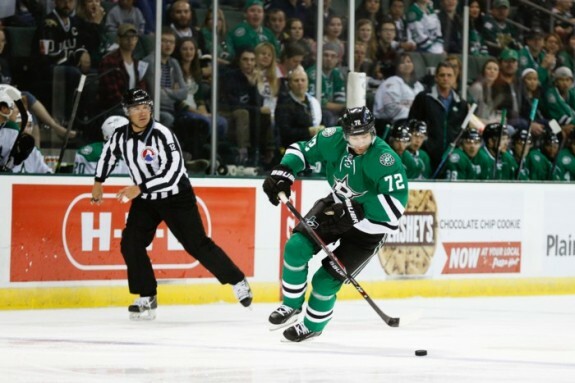 However, he provides an accurate shot on the power play and the ability to thread the needle on breakouts. 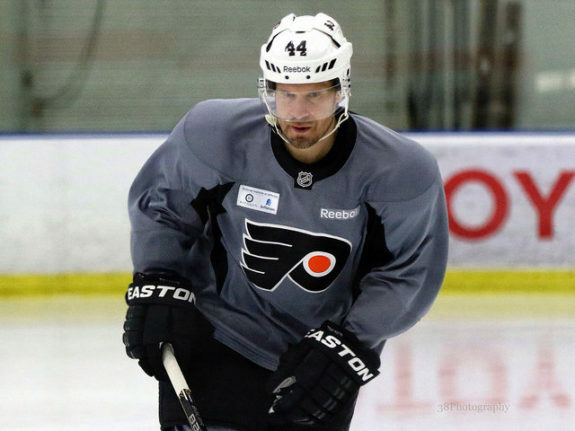 Timonen, who turns 40 this month, is set to become a UFA this summer. He’s a short-term fix, though, and the price of two draft picks seems minimal given the potential upside to his game. The Blackhawks also moved forward Ben Smith to the San Jose Sharks in exchange for Desjardins, who had half of his salary retained by the Sharks. He not only fills a valuable bottom-six role for Chicago, but his contract gives the Blackhawks a little more room underneath the cap. Although these moves appear to be rentals for Chicago, they have set themselves up nicely to return to hockey’s top stage in June. If the organization can get Kane back ahead of schedule, this may be the team to beat from the Western Conference. The big names came and went. Sergei Fedorov, Steve Yzerman and Nicklas Lidstrom have all moved on, yet the Red Wings just keep on chugging out annoying teams. I use that term in the most endearing way possible. In 2013, the seventh-seeded Detroit team knocked off the No. 2 Anaheim Ducks in the first round and stretched the eventual champion and No. 1 seeded Blackhawks to seven games in the second round. Last season, they stole Game 1 of the Eastern quarterfinals against the top-seeded Boston Bruins with a 1-0 victory. Although the Bruins took the series in five games, the always-present threat loomed large with the Motor City team. GM Ken Holland always puts his team in a position to win. He has done so again in 2014-15, trading for right-winger Erik Cole and a conditional 2015 third-round pick in exchange for two expendable prospects and a 2015 second-round selection on Sunday. He added veteran defenseman Zidlicky for just a 2016 third-round pick hours before the 3 p.m. deadline. These moves may not seem groundbreaking, but they solidify an already well-rounded Red Wings lineup. Cole, a power forward, can fill in anywhere on the top-nine forward group, supplying a punch that would normally be provided by the oft-injured Johan Franzen. Zidlicky, 38, becomes just the third defenseman 30 or older (Niklas Kronwall, 34, and Jonathan Ericsson, 30), contributing leadership and aptitude to the locker room. Combined, the newcomers add 84 postseason contests to the roster, while Cole brings a Stanley Cup ring (2006). You might not say that these two clubs are the big winners at the deadline. You may not have even batted an eyelash after hearing about the recent moves made by the New York Rangers and Winnipeg Jets. They did what they needed to do, though. They have set themselves up to win … again.